One of the newest additions to the gallery’s extensive inventory are paintings and assemblage by the renowned Argentine artist Ernesto Berra. With more than 60 solo exhibitions and a dozen top awards, Berra is one of the leading artists in a nation known for its outstanding plastic arts. 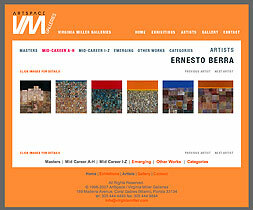 Berra’s geometric abstractions, which evolved from a period of abstract assemblage that paid homage to Joaquín Torres-Garcia, sometimes are referred to as “walls.” Some of the works resemble deteriorating walls in urban settings, but critics and art historians agree that Berra’s finely tuned composition and color elevates the work to a more spiritual plane.